The lights went down, and figures staggered slowly onto the stage accompanied by loud mouth-breathing. No, this was not a stage adaptation of The Walking Dead (although I would totally go see that), it was Live Action Set's newest creation entitled The Sparrow. 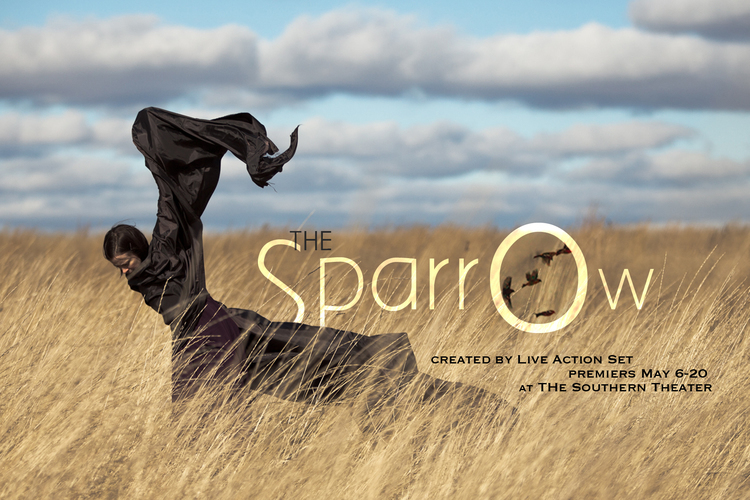 Like their previous two works presented at the Southern Theater (Basic North and The Half Life) The Sparrow is an odd and lovely piece that combines movement, music, acting, and spoken words. 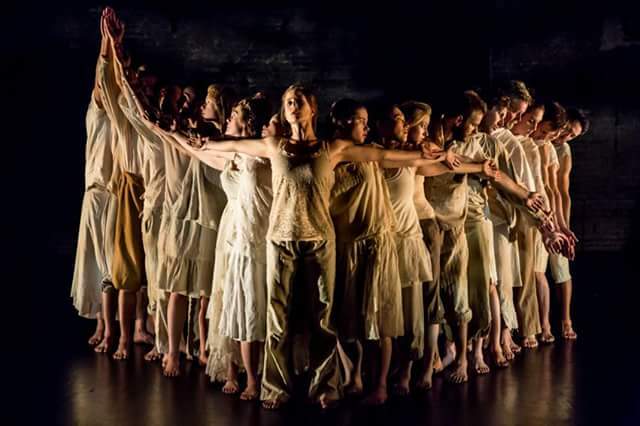 Not quite dance, and very far from what we typically think of as theater, it's an experience that defies description, but is definitely recommended if you're looking for something different and beautifully expressive (even if I'm not sure of what). Sea-weary sailors regard the arrival of a sparrow as the harbinger of a journey's end. With it, momentum recycles, and a new journey begins. "The Sparrow" celebrates a world of infinite possibilities as it takes hold of joy by the jowls in this new portrait of explosive expression by genre-blurring Live Action Set. I did not get half of that, but I don't think that matters. As director/creators Noah Bremer and Joanna Harmon explained in the post-show discussion (which they hold after every performance*), though they and the 20+ person ensemble might have a story arc in mind, it's not necessarily important that the audience sees exactly that. Rather that we open our minds and let the piece speak to us in whatever way it happens to. Which is difficult for logical left-brained people to do, but is also refreshing and rewarding when we let it happen. The entire company in chevron formation (steady on, how often do I get to use that phrase?!) moves as one being, their many arms forming the wings of the sparrow as they flap gently. Sometimes recorded music accompanies the movement, at other times silence, at other times wordless singing or screaming, which is sometimes lovely to listen to, sometimes uncomfortable. 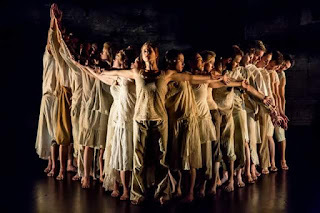 Neutral-toned flowy clothing in the first 30-minute act is replaced by monochromatic whimsical outfits in different bright primary colors (costuming by Joanna Harmon). Actors stare directly at the audience while telling a short story with no facial expression. During intermission question cards are passed out to audience members, which they have an opportunity to ask in the second act. Actors come forward to choose an audience member and answer their question (ranging from "why are we here" to "why don't people want to learn cribbage), which they might not have previously heard or prepared for, but still answer with complete confidence. A couple declares their feelings for each other in uniquely expressive ways ("I want to sack Rome with you," "I want to lie to you for no reason and then wonder why I did it") while finding interesting shapes with their bodies. 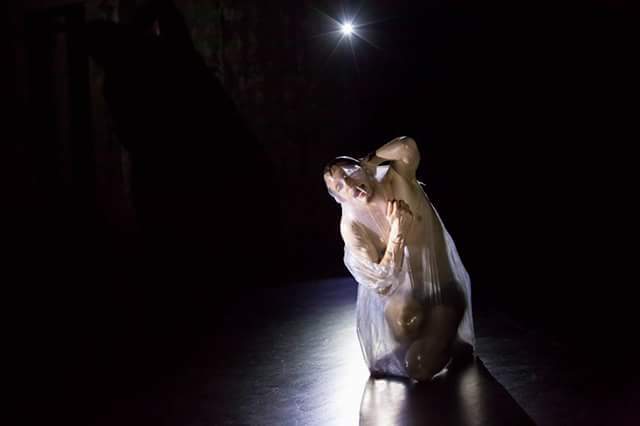 A dancer slowly and painfully breaks out of a plastic bag, representing (I think) a baby bird breaking out of its shell. Fascinating to watch, and also worrisome (warning: keep plastic bags away from children!). I'm not sure this piece would work as well in any other space besides the Southern. The cavernous space with the shabby chic original arch of the theater provide the perfect backdrop for this kind of movement that is outside of time and place, and the steep pitch of the seats allows the audience a great view of the shapes created from above. Here are a few words I jotted down at intermission: playful, graceful, awkward, joyous, perplexing. Live Action Set's The Sparrow is a beautiful piece of art that combines many genres of expression, and is a refreshing change of pace from the usual theater fare. Continuing through May 20 at part of the Southern's ARTshare program. *I recommend attending the short post-show discussion to get more insight into the piece, and because it's awkward when there are more people on the stage than in the audience for the talk-back.